The first half of the year, from January to May, is the best time to visit the country. November to February is cool, while March to May is hot and dry. June to October is rainy, with the months between July and September characterized by typhoons. Average temperature is 78 degrees F or 25 degrees C; average humidity is 77%. Some parts of the country such as Cebu, are warm and comfortable in all seasons and can be visited throughout the year. For up-to-date weather information, visit the Philippine Atmospheric, Geophysical and Astronomical Services Adminstration (PAGASA) website: www.pagasa.dost.gov.ph or call PAGASA 24-hour hotline +63 2 4338526. Two official languages --- Filipino and English. Filipino which is based on Tagalog, is the national language. English is also widely used and is the medium of instruction in higher education. Eight (8) major dialects spoken by majority of the Filipinos: Tagalog, Cebuano, Ilocano, Hiligaynon or Ilonggo, Bicol, Waray, Pampango, and Pangasinense. Filipino is the native language which is used nationally as the language of communication among ethnic groups. Like any living language, Filipino is in a process of development through loans from Philippine languages and non-native languages for various situations, among speakers of different social backgrounds, and for topics for conversation and scholarly discourse. There are about 76 to 78 major language groups, with more than 500 dialects. MANILA, Philippines -- Section five of the Tobacco Regulation Act of 2003 (Republic Act 9211) prohibits the carrying of any lighted tobacco product in public vehicles, schools, health centers, elevators, cinemas, malls and in places where fire hazards are present. Smoking is also banned in recreational facilities for minors. Fines imposed on violators of this section range from P500 to P10,000. 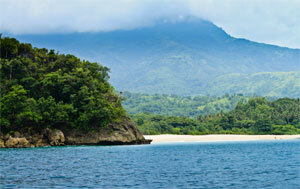 message to your friends to tell them about this Travel Guide - General Travel Information about the Philippines page.